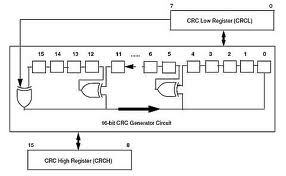 CRCs are based on the theory of cyclic error-correcting codes. The use of systematic cyclic codes, which encode messages by adding a fixed-length check value, for the purpose of error detection in communication networks was first proposed by W. Wesley Peterson in 1961. Cyclic codes are not only simple to implement but have the benefit of being particularly well suited for the detection of burst errors, contiguous sequences of erroneous data symbols in messages. This is important because burst errors are common transmission errors in many communication channels, including magnetic and optical storage devices. Typically, an n-bit CRC, applied to a data block of arbitrary length, will detect any single error burst not longer than n bits, and will detect a fraction 1-2-n of all longer error bursts. Specification of a CRC code requires definition of a so-called generator polynomial. This polynomial resembles the divisor in a polynomial long division, which takes the message as the dividend and in which the quotient is discarded and the remainder becomes the result, with the important distinction that the polynomial coefficients are calculated according to the carry-less arithmetic of a finite field. The length of the remainder is always less than the length of the generator polynomial, which therefore determines how long the result can be. In practice, all commonly used CRCs employ the finite field GF(2). This is the field of two elements, usually called 0 and 1, comfortably matching computer architecture. The rest of this article will discuss only these binary CRCs, but the principles are more general. The simplest error-detection system, the parity bit, is in fact a trivial 1-bit CRC: it uses the generator polynomial x+1. * Description: A header file describing the various CRC standards. * expressed or implied by its publication or distribution. * Select the CRC standard from the list that follows. #error "One of CRC_CCITT, CRC16, or CRC32 must be #define'd." * Description: Slow and fast implementations of the CRC standards. * here should stand up to further additions to that list. * Derive parameters from the standard-specific parameters in crc.h. * them about the middle position. * Notes: No checking is done that nBits <= 32. * Returns: The reflection of the original data. * Reflect the data about the center bit. * If the LSB bit is set, set the reflection of it. * Description: Compute the CRC of a given message. * Returns: The CRC of the message. * Perform modulo-2 division, a byte at a time. * Bring the next byte into the remainder. * Perform modulo-2 division, a bit at a time. * Try to divide the current data bit. * The final remainder is the CRC result. * Description: Populate the partial CRC lookup table. * the table results stored in an embedded system's ROM. * Compute the remainder of each possible dividend. * Start with the dividend followed by zeros. * Store the result into the table. * Notes: crcInit() must be called first. * Divide the message by the polynomial, a byte at a time. * The final remainder is the CRC. Next Next post: Using tables to optimize your code for speed (C/C++).